StandAloneArcade is a free social arcade platform. We make it easy for you to create your own fully featured arcade website. StandAloneArcade has an easy to use game adder which allows you to add thousands of games instantly and easily from MochiMedia. StandAloneArcade has full multi-language support, multi-theme support, and tons of admin options. Everything is easily customizable! SAA supports multiple game sources and game types, featuring a full highscore system with leaderboards for top players and games. 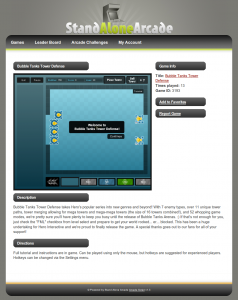 Users can even compete against their friends in user to user challenges! Installation only takes a minute. We’ve got an awesome, super-simple step by step installation guide that comes with the download. 3. After the update is completed and the scores have been imported from the legacy version, make sure to run rebuild scores under “Tools” -> “Rebuild” menu of the admincp. Note: After either install or update, make sure the setting in the admin control panel are set. 2. After the facebook app has been created, be sure to add the Facebook App ID and Facebook Secret Key to SAA admin settings. 3. Make sure that the ‘enable facebook login’ SAA setting is set to on. Added error trap for simplexmlelement->count workaround for php versions < 5.3.0. Added error trap on settings -> facebook for when facebook login is on and app id and/or secret key dne. Fixed the undefined index for game tags. Fixed install create user error. Fixed login/create user via fb error. Fixed game category cache rebuild pagination error. Fixed game edit tag multiple row insert bug. Fixed game.adder.mochi->importSingle issue with $aJson[‘games’] being array of count zero.